Posted Friday, July 30th, 2010 by Greg Gladman. Giclée printing is a form of reproduction that allows artists to print high-resolution copies of artwork that have been digitally saved or created. This process requires a large-format inkjet printer that exceeds the standard four-cartridge ink system of average inkjet printers. Technically, Giclée can refer to any inkjet printing, but generally it is used to specifically denote high-resolution printing. According to Wikipedia, the term Giclée was coined in 1991 by a printmaker named Jack Duganne and derives from the French noun gicleur (nozzle) and French verb gicler (to squirt, spurt or spray). Basically, the appeal of this type of printing for artists is that the old industrial machines would make hundreds or thousands of copies at a time and cost quite a bit of money. With Giclée, artists can make a high-grade reproduction of a piece of art as it is ordered for minimal costs without sacrificing quality. Since this technique was developed, multiple pieces of Giclée artwork can be found at galleries and museums in some of the world’s biggest cities. In fact, photographer Annie Leibovitz has sold Giclée prints for over $10,000. The Epson Stylus Pro 7600 is an example of a Giclée printer. It is a large-format printer, meaning it can produce prints up to 24 inches wide. The length of the print is hindered only by the length of the roll of paper that is being used. There are actually 11 cartridges available for this particular unit, though not all 11 can be installed at the same time. The cyan, magenta, and yellow cartridges come in two forms – dye-based and pigment-based. 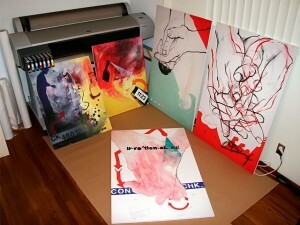 The dye-based options are fine for standard printing but will be insufficient for Giclée prints. The other cartridges are pigment-based, including regular black, light black, matte black, light cyan and light magenta. Having variations of the common CMYK inkjet cartridge system expands the color gamut and makes the gradient transitions smoother. Two of the key factors for Giclée printing are archival-quality ink and substrates, or media types. Archival ink is resistant to smudging, fading and water, so it is guaranteed to last for many, many years. The ability to print on various sizes and canvases, such as textured vinyl, watercolor and matte paper, allows artists the ability to customize each print for the client. Giclée printing also gives the artist full control over the production process and the accessibility to these special printers, inks and paper types can allow artists to do this all from their home. It doesn’t matter if you have painted a beautiful portrait that you scanned via a high-resolution scanner or digitally created a piece of art on your computer, a Giclée large-format printer will give you the opportunity to print gallery-quality copies of your work. As this trend grows in popularity, it has the potential to give unknown artists a new forum and art enthusiasts a more affordable way to purchase great artwork.